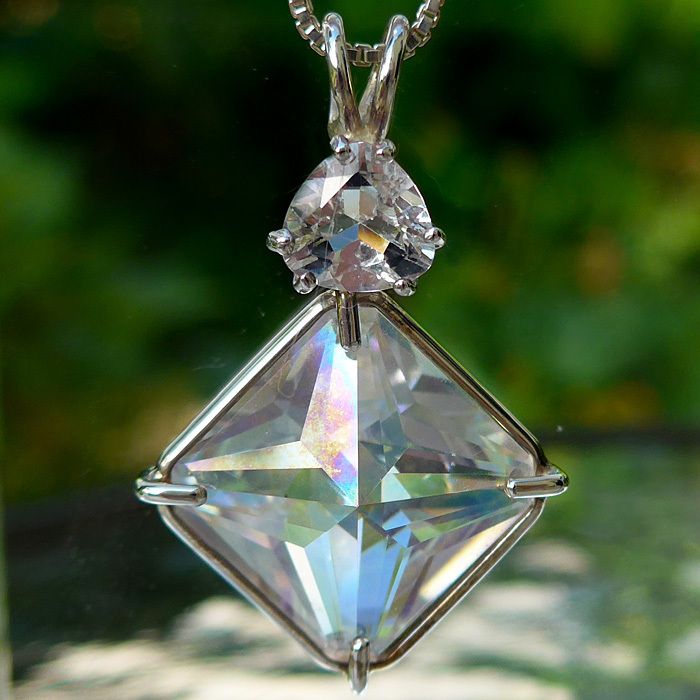 Dimensions (HxWxD): 1.3" x .8" x .33"
This beautiful water-clear Angel Aura quartz Magician Stone crystal pendant is crowned with a Trillion cut Danburite gemstone. This pendant is of exceptional quality, both in the style of the stone and in the simple silver band setting which allows the stone to breathe and function at its highest vibration. This pendant comes with a simple sterling silver chain which will sit upon the thymus, between the throat heart chakra, where it will be of most beneficial resonance. We often recommend that our Reiki and past life therapy clients wear crystals or gemstones for protection, especially clear quartz which contains all colors of the spectrum and works on all the bodies: physical, mental and emotional. Angel Aura quartz exhibits all the energetic properties of clear quartz crystal, along with some additional properties described below. Angel Aura quartz is a form of laboratory enhanced quartz crystal that is extremely tough, durable, and beautiful. Clear Quartz crystal that has been selected for its structural integrity is subjected to stress tests and then introduced into a vacuum chamber. 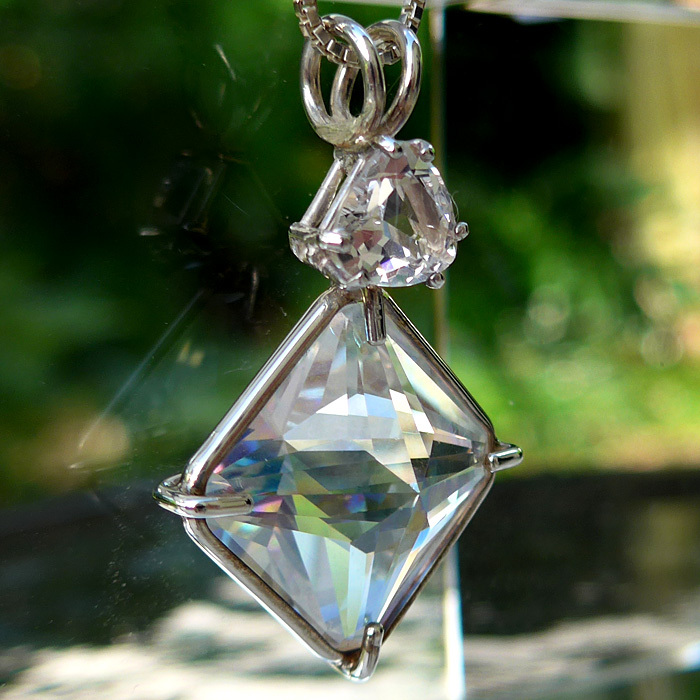 Platinum and/or silver is vaporized within the chamber at extremely high heat, and the gaseous metals adhere to the surface of the quartz crystal, creating an iridescence that is unique and extremely beautiful, exhibiting pale pink, blue and lavender flashes of color that are quite unlike anything seen in naturally occurring minerals and quartz crystals. Only crystals with strong structural integrity can withstand the process. Crystals with inclusions or other structural flaws can literally explode during the treatment. Metaphysically, Angel Aura Quartz is said to combine the energies of clear quartz with the energies of the violet, blue and silver rays, activating the entire chakra system, stimulating the flow of Universal Life Force Energy in body, mind and aura, and connecting the bearer to Higher Worlds, specifically to the Fairy Realm and to the Abode of Angels. This pendant comes with a simple sterling silver chain which will sit upon the heart chakra, where it will be of most beneficial resonance. Note: Weight above is shipping weight. Average weight of this pendant is .35 oz. or 9.92 grams. Each piece is unique and may vary slightly in appearance. Each piece is guaranteed to be beautiful and to meet with your complete satisfaction!